We provide the same consistent quality product time and time again, and ensure you get it when you need it. Our mulch products are the preferred choice by the civil and landscaping industries and have a wide range of applications in roadworks, construction, landscaping and soil regeneration. McMahon’s Transport is a major supporter of Convoy for Kids and was lead truck in 2014 raising $192,000 for kids with cancer. McMahon's Transport offers a full range of premium mulch products. McMahon's Transport has been operating for many years and in that time have developed its offering to service a wide range of valued clients like you. We support this with products that enable us to be a full service provider to several industries. We pride ourselves on being a dependable and loyal transport partner. Providing you with premium products, continuous supply, and reliability in every shipment we manage. We have a proven and long history in transport services and are passionate about providing great service and reliable delivery. We provide cartage services, and have a large collective of reputable sub-contractors that we work in conjunction with. Our vehicles are satellite tracked to provide accurate details of the route and progress, including ETA, of your delivery, ensuring time sensitive transport and distribution, protecting your interests with WHS Chain of Responsibility. Our professional drivers are trained in their Mass Management and Basic Fatigue compliance. 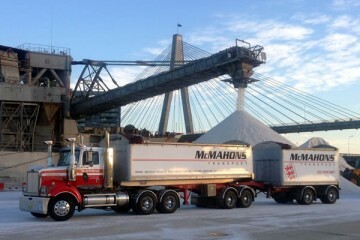 McMahons Transport (NSW) Pty Ltd is a wholesaler of bulk landscape and building materials. Our fleet of trucks provide a supply and deliver service of 70m3 to 100m3 volumes in Truck and Dog, or B-Double combinations. In addition, we provide cartage services, and have a large collective of reputable sub-contractors that we work in conjunction with. Our vehicles are satellite tracked to provide accurate details of the route and progress, including ETA, of your delivery, ensuring time sensitive transport and distribution, protecting your interests with WHS Chain of Responsibility. Our professional drivers are trained in their Mass Management and Basic Fatigue compliancy.